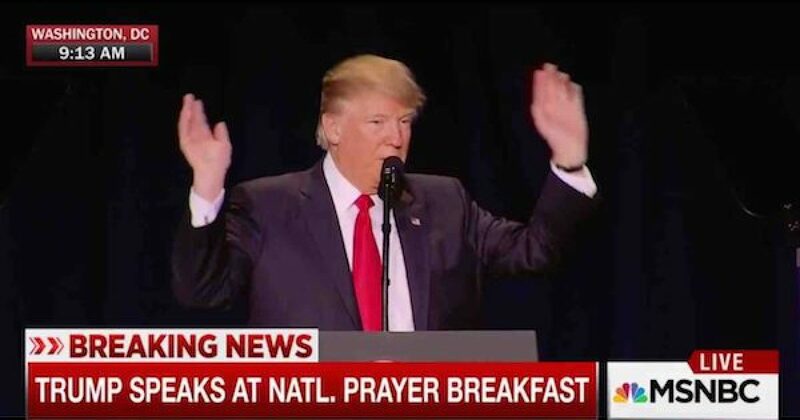 Last week President Trump gave an impassioned speech at the National Prayer Breakfast where he called Americans to give thanks for God’s providential hand of mercy on our nation. “That is why the words ‘Praise be to God’ are etched atop the Washington Monument and those same words are etched into the hearts of our people. So today we praise God for how truly blessed we are to be American,” the President said. Later, the White House released a memo extolling all of the brilliant work the President has done on behalf of America’s faith community. The memo covered four major topics; How the President has stood for religious freedom. How he’s made religious liberty a priority of his administration. How he’s fought to defend the sanctity of life, and how he’s fought against the spread of abortion in our world. Finally, the memo covered how the Trump administration has worked to engage the people of faith in a more faithful way than the Obama administration did over the last decade. The Trump administration has indeed worked hard to curry the favor of the faith community in America, and that work can be seen particularly in their efforts on abortion and on the administration’s defense of religious liberty. Hopefully, the rest of President Trump’s tenure continues to be as favorable to our nation’s faith community.